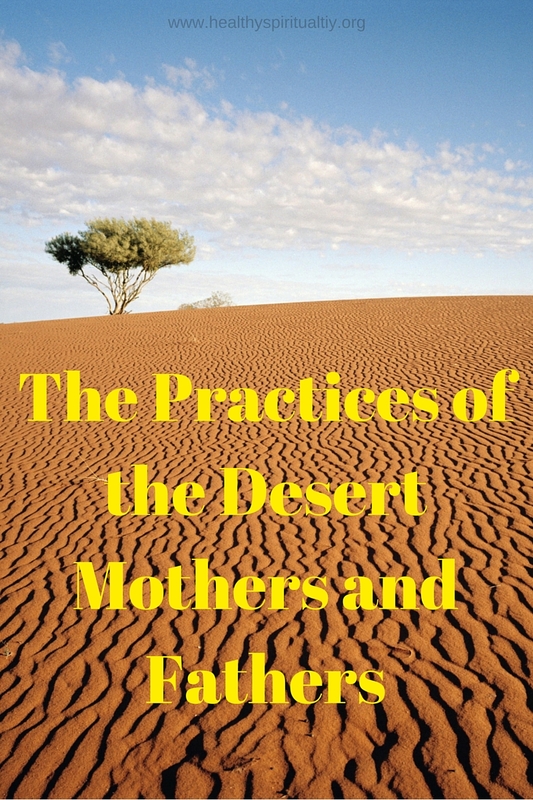 Last Thursday we met the Desert Mothers and Fathers and this week we will look at some of their practices that may help us on our spiritual journey. Each month on Thursdays, I plan to write about a specific theme that helps us discover and explore people and practices that tend the holy. Spending several weeks on a topic will add depth to our spiritual walk. Just as a reminder the Desert Mothers and Fathers lived in the 3rd and 4th centuries. As Christianity became accepted as an approved faith and no longer opposed by the governments, Christians continued to hunger for a deeper relationship with God. Groups of men and women lived in the desert or just outside of the cities in the Middle East and became known as the Desert Mothers and Fathers. Many of them lived like hermits, living in caves but did gather into communities periodically. Others sought them out to learn from them so many of them were rarely alone. The lived a humble, simple existence. We can gather ideas from how they practiced and lived their faith. A word of caution: some of the practices were pretty extreme so I am not going to mention or delve into all of their habits, but many practices are pertinent to our faith walk today. The Desert Mothers and Father called silence “hesychia” which means inner quiet, rest, and stillness. Silence helped them with discernment and to hear God. We let go of all the external and internal chatter to draw near the whisper of God and discover the space between words. In practicing silence I am learning to be more selective in my words and often choosing not to speak just to make my opinion known. Silnce helps us to intentionally create a space to surrender to the unknown and to hear what another Voice has to say. We run from facing our darker selves through numbing ourselves with busyness, noise, food, alcohol, shopping or whatever distract us from befriending, talking and managing with our own “demons.” We flee but we can’t hide. Meeting God in solitude and in his tender, accepting embrace, we can openly address our sins and imperfections and become shaped by his presence. I value more than ever the practice of retreat and morning private prayer. The Desert Mothers and Fathers remind us to travel light. Let go of our burdens, anger and bitterness that block us from God. Focus only on carrying the essentials. This one is hard for me and I am learning that what served me in the past, no longer fits in this season of my life. Setting aside desires, a former strength that used to serve me well, and even my self-identity and grasping only the hand of God makes this part of my journey simpler. Less stuff, more spirit in my satchel. The heart of the desert life included both vocal prayer and contemplation. Prayer was primary for the Desert Mothers and Fathers and they spoke continually with him. They were deeply connected to Jesus teaching and hungered to be close to God. To pray always – this is the real purpose of the desert life. Theophan the Recluse wrote, “to pray is to descend with the mind into the heart and there to stand before the face of the Lord, ever present, all seeing within you.” Many of their prayers were wordless; but being with God in their daily activities. Words were lifted up sparingly. Prayer was not complicated but a way of life. I am learning not so much to “do” prayer but to be in prayer. “We always begin again.” I am always learning and believe in seeking wisdom throughout life. Sometimes we have to unlearn too and be willing to let go of outdated, narrow thinking. The Desert Mothers and Fathers teach us to be open to new insights and to practice lifelong learning. These wise men and women remind us that the love of God and of our neighbor should rule our heart, mind and actions. Be charitable. Daily finding ways to love and to be love is how we become fully human. I missed a chance this morning to be love to someone and this has haunted me all day. One thing I do know, next time I will take action sooner and without hesitation. The word humility comes from the root word, hummus, meaning of the earth or earthiness. To remember we are NOT God and our faith isn’t in ourselves but in God. Take ourselves lightly. This is not humiliation, not being worthless but acknowledging we are created in love by God. It’s about God, not us. 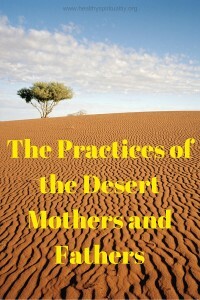 If you want to get an “infographic” of the Desert Mothers and Fathers practice, click below. It is my gift to you for this journey together. Which of these practices invite you closer to God? “A beginner’s mind” – that’s the one I’m least familiar with from the Desert Mothers and Fathers. I’ve heard it more from the Buddhist traditions, so I’m glad to see it pop up here from centuries ago. 🙂 I love the thought of it, and would like to practice it more and more myself. Hi Jean! I’m a bit of a hummus lover myself! On the surface, a life of this kind is so attractive. Quiet. Prayer. Solitude. I suppose I’d really go nuts after a while, but I do admire the Desert Parents. Their prayer lives must have been amazing. My only hope is that God will give me the grace I need in the feeble prayers I pray! Every time I read about them I learn something new. I know they did have some extreme practices and I don’t agree with everything but what a rich heritage they left for us. Have a wonderful weekend, Ceil! I had to smile when I read that the word “humility” comes from the root word, “hummus.” I love hummus! I’m talking about the chick-pea mash that makes such a delectable dip for veggies, pita bread, etc. I eat some nearly every day. Now when taking the hummus out of the fridge, I want to be reminded that the day and my participation in it are for God’s glory–whatever is happening, whatever I’m doing. It’s about him; not me. Now hummus can be a reminder to think, speak, and act with humility! Thank you, Jean, for sharing these meaningful disciplines. Indeed: “Earthiness” adds more dimension to the word. Humility is a natural outgrowth of being deeply grounded in our all-powerful, all-wise God. The deeper we grow in him, the less “self” matters! earthiness also reminds us that we are dust and will be dust. It is God’s breath that gives us life and who we are. The word earthiness is really lingering with me today…. I don’t think there is one in particular for me, Jean, because all serve to bring us closer to God. If I had to choose, though, it would be silence – it is the time when we can simply be still with God in wordless prayer. Blessings! I know the practice of silence has been surprisingly deep for me. If you would have told me that years ago, I would have never believed you. HA amazing how God works in us right?